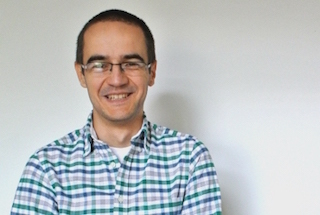 Alex became a member of the Altmetric team in March 2017 and remains bent on not being separated from the green Kentish valleys that became his home after leaving Romania years ago. He commutes into London from Canterbury every morning and helps provision, automate and support the infrastructure that makes the Altmetric magic possible. When not at work, Alex (often clumsily) juggles his time between tending a vegetable plot and (re)watching the Star Trek series with his partner, reading, dabbling in citizen science projects and keeping the dust off of his Social Anthropology BA by trying to stay up to date with world issues, politics and events. He may also have a slight addiction to sourdough. In an average day I juggle a combination of putting out any existing fires, fire-proofing various parts of our hardware and code base and tinkering on some component of The Ultimate Infrastructure (TM), which will change the laws of physics and essentially make fires impossible. Patent pending. The best part of my job is working with a minblowingly smart collective of people who are constantly acting as extra pairs of hands to help me keep things in the air. Getting to hug Question dog when things get tough is a great second best. The most interesting thing I’ve learnt since starting at Altmetric is the extraordinary importance and impact of an inclusive, supportive, no-blame work environment. The thing I’m most looking forward to next is building better and smarter ways of collecting and providing altmetrics data and insights; this year’s Altmetric Top100; and the (undoubtedly imminent) enactment of my proposal to have one or more resident office cats.